When I last wrote I was expecting to spend a few days recovering from a chest infection in Chivay. It turned out to be a little more serious than that and it was necessary to avail myself of Peru’s rural medical services together with a course of intravenous antibiotics. Being unwell far from home was not an entirely negative experience and it reminded me that no matter where you are in the world, there are people who will do their best to help you. My stay in Chivay extended to more than two weeks, and while I would rather have been on my bike in the mountains it meant I had time to build some meaningful friendships in the village. Particularly when travelling solo I find the relationships I build along the way are important to me and add to the richness of the journey. When I was finally able to leave Chivay, and still quite weak, I tentatively climbed back out of the upper reaches of the Colca Canyon, heading back above 4000m and to the high mountains that I love so much. As I cruised uphill along the banks of the Rio Colca I met an old gent on a Chinese-made boneshaker bicycle heading in the opposite direction. As cyclists often do, we stopped to exchange greetings. I mentioned where I was headed to which he sucked his teeth, rubbed the finger and thumb of one hand together and jabbed me in the chest, twisting his fngers as he did. The implication was that travelling solo in such places I was sure to be robbed and killed. I have found it to be the same the whole world over – if I cycle through a valley, the people there, otherwise very welcoming, will often tell you that by travelling into the next valley you are sure to be robbed, or worse, because that valley is full of bad people. Arrive in the next valley and the people will express shock that you were able to travel through the previous valley without being robbed or killed, because that valley is full of bad people. I have discovered that the more remote the places travelled, the stronger the communities and the more friendly the people. Just that evening I was invited to stay with a family in the quiet village of Sibayo and I spent a lovely evening tucking into a hearty alpaca stew with Benita, her husband Caesar, and ten year old son Ciamillo. The following morning Benita sent me packing up into the rarefied air towards 5000m with a hearty breakfast of quinoa porridge, eggs, bread, coffee, and a happy heart. Another reason I travel the way I do. As I write I am in the provincial town of Espinar. It is a lively, friendly place. It would seem that I am the only ‘gringo’ in town and as such have been made overwhelmingly welcome. Yesterday was Peru’s Dia de La Bandera (Flag Day). A celebration and commemoration of the Battle of Arica, 7th June 1880, in which General Alfonso Ugarte saved the Peruvian Flag from Chilean troops by riding his horse, with the flag, off a cliff into the Pacific Ocean. The event is very much a commemoration of his sacrifice. The day was a wonderful, colourful, happy display of Peruvian identity. It was by pure luck that I arrived in town on the evening of the 6th. Had I not been waylaid in Chivay I would likely have been alone in the mountains much farther north. Clouds do very much have silver linings that often manifest themselves in unexpected ways. Due to some difficulty recovering fully from my chest infection, my journey has changed from a long distance linear route north to a more intimate exploration of this part of Southern Peru. It will still involve some extremely remote, high mountain trails and passing through isolated communities, but it also has a few more options for rest days and exits from the high mountains should I not be strong enough to continue. Rather than being deeply disappointed it is simply a case of exchanging one flavour of adventure for another – I will have the opportunity to explore places I would not otherwise have visited, and I now have even more reason to return to Peru and the high Andes once more. 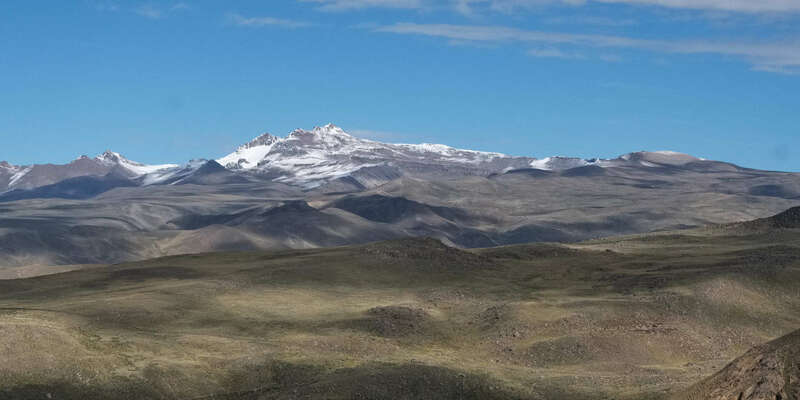 At an altitude of around 4700m the road from Sibayo reaches a plateau. It is stunningly beautiful place. The highlands are dotted with tiny pueblos. The people are overwhelmingly friendly and always ready to talk. This is the remote outpost of Caylloma. Sitting high on the puna at about 4300m it can feel a desolate place, particularly in the afternoons when dust devils, whipped up by the icy winds, rampage through the streets and the harsh, high altititude sun bleaches the colour from the landscape. Caylloma has electricity for things like satellite TV – most of the time. From Caylloma the track took me straight into a steep, hairpinned climb all the way to 5000m. Watching the occasional airliner pass overhead being an interesting reminder of just how high that is. Rather than a tiny speck, as we are more accustomed to seeing from sea-level, being on my bike at half a typical cruising altitude aircraft pass overhead sufficiently close to be able to identify the airline. The summit of the pass was a forbidding place with occasional snow flurries swirling in the thin, icy gale. The high passes of the Andes are a wonderful place to travel by bicycle – provided one enjoys a degree of hardship and isolation. Pueblos are very few and far between in these places, but despite the isolation school children are always immaculately turned out. Leaving the 'road' behind I joined a mule track I'd found on satellite imagery. Hours of hard climbing on the alternately rocky and boggy track took me to a remote pass at 4700m. With just an hour of daylight left and snow flurries swirling in the strong winds it was time to find a spot to spend the night. As always with the arrival of darkness the temperatures plummeted to negative double digits. Morning brought sunshine happily, as well these two. They had spotted my tent and came by to say hello as I was cooking breakfast. They said they were camped nearby, prospecting for gold. A muddy descent to a warmer, more intimate situation. It is a lovely feeling to arrive in gentler, more rural countryside after time in the hostile highlands. I was able to join the rather lovely dirt road to Espinar with just 30km or so left to ride. A mellow cruise through rural Peru along the banks of the Apurimac river being a fitting end to a superb leg of the journey.